Is Gluten a Problem for You? Is gluten bad for people with fibromyalgia (FMS) and chronic fatigue syndrome (ME/CFS)? Would you feel better eating a gluten-free diet? You can certainly find a lot of people online who say cutting out gluten has really improved their symptoms. 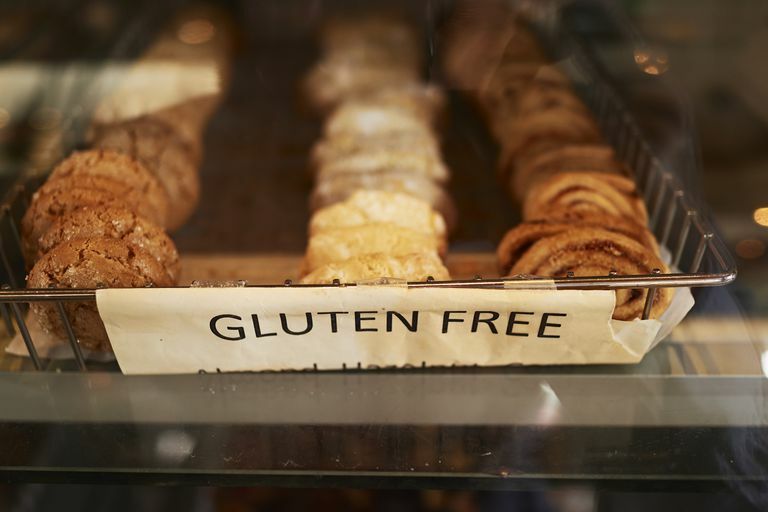 With the media attention, gluten-free diets have received over the past several years, it stands to reason that a lot of people with these illnesses have given them a shot. Both anecdotal results and research shows that being gluten-free doesn't help all of us—for some people, it's life-altering; for others, it does nothing other than take away their favorite foods for a while. We still don't have a ton of research, but we have learned a little bit about FMS and gluten over the past few years. As is so often the case, we don't yet have research to guide us when it comes to ME/CFS. People who can't handle gluten generally have significant intestinal problems, which can include pain, cramping, diarrhea, and just about any other digestive problem you can think of. The two main causes of gluten intolerance are Celiac disease—which is an autoimmune reaction to gluten in the intestinal lining—and non-Celiac gluten sensitivity. We have a study published in Arthritis Research & Therapy that suggests Celiac disease may be more common in people with FMS and irritable bowel syndrome (IBS) than in those with IBS alone. However, it was a small study, involving just 104 people, seven of whom tested positive for Celiac. For a separate study, which came out in BMC Gastroenterology, the same research team then put those seven people on a gluten-free diet for a year to see how symptoms responded. Results suggested that cutting out gluten improved not only Celiac symptom but also FMS and IBS symptoms, as well. But what about the 93 percent of people with FMS who don't have Celiac disease? The same researchers looked again at women with FMS/IBS along with lymphocytic enteritis (watery diarrhea associated with inflammation of the intestine and the presence of a particular immune marker.) They found that a gluten-free diet improved symptoms of all three conditions in these people, as well. In 2016, a study in the Journal of Clinical Gastroenterology compared the effects of a gluten-free diet to a low-calorie diet in people with both FMS and symptoms of gluten sensitivity. Both diets appeared to reduce gluten-sensitivity symptoms and there wasn't any difference in their effect on other symptoms. In light of this, it could be that simply eating a healthy diet--and not specifically a gluten-free one--is what's generally helpful in FMS. It'll take more research to know for sure. So, while results are somewhat mixed, it looks like people with FMS+certain digestive problems may well benefit from a gluten-free diet. For those with FMS who don't have these digestive problems, we don't have the research to say either way. It's too soon to know what the relationship of gluten is to these conditions. However, if you want to see whether a gluten-free diet helps you feel better, it's safe to try as long as you approach it properly. Be sure to talk to a doctor and educate yourself before you start. Gluten-related symptoms can be extremely similar to those of FMS and ME/CFS—including some neurological symptoms. They're also similar to IBS, which is extremely common in FMS and ME/CFS. Instead of looking for the existence of a symptom, you may need to keep a food/symptom log to see if certain symptoms get worse when you eat gluten-containing foods or improve when you avoid them. A gluten-free diet isn't easy. However, if it helps you feel better, it may be well worth it. Examine your symptoms and your eating habits, educate yourself, and talk to your doctor. If you try it and figure out you're not one of the people who get significant relief from eating gluten-free, don't despair. You have plenty more options to explore for alleviating your symptoms. Isasi C, Colmenero I, Casco F, et al. Fibromyalgia and non-celiac gluten sensitivity: a description with remission of fibromyalgia. Rheumatology international. 2014 Nov;34(11):1607-12. doi: 10.1007/s00296-014-2990-6. Rodrigo L, Blanco I, Bobes J, de Serres FJ. Effect of one year of a gluten-free diet on the clinical evolution of irritable bowel syndrome plus fibromyalgia in patients with associated lymphocytic enteritis: a case-control study. Arthritis research & therapy. 2014 Aug 27;16(4):421. doi: 10.1186/s13075-014-0421-4. Rodrigo L, Blanco I, Bobes J, de Serres FJ. Clinical impact of a gluten-free diet on health-related quality of life in seven fibromyalgia syndrome patients with associated celiac disease. BMC gastroenterology. 2013 Nov 9;13:157. doi: 10.1186/1471-230X-13-157. Rodrigo L, Blanco I, Bobes J, de Serres FJ. Remarkable prevalence of coeliac disease in patients with irritable bowel syndrome plus fibromyalgia in comparison with those with isolated irritable bowel syndrome: a case-finding study. Arthritis research & therapy. 2013;15(6):R201.